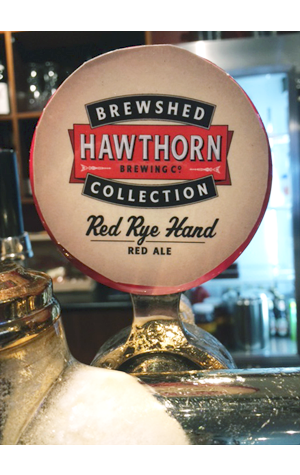 Busy times for Hawthorn Brewing Company. Following success in recent years at the International Beer Challenge they've signed a deal to have their Pale and Pilsner ranged throughout the UK by Majestic Wines. And they've finally found the time to launch their first small batch Special Release in the form of the Nick Cave-referencing Red Rye Hand. Launched at GABS 2015, it's since popped up on taps (mainly around Victoria) and, once drained, that's it as this is a draught only release. Described as "a hop forward red ale with the added complexity of rye in the malt bill" it certainly delivers the rich malts you'd expect, mainly of the creamy caramel variety with a touch of spicy rye character. More than that, however, it hits you up with a wall of hops, of the citrus and tropical variety and all from American varieties. Brewer Hamish Reed says they opted for "a generous hopping program in both the whirlpool and in tank" and one sniff will lead you to concur. Look out for two small batch releases a year from Hawthorn from now on.